Today is a Holiday!!! Yippee for all of you that get to stay home from work! How was your weekend? We helped Lexie celebrate her 6th birthday. She had a fun fall birthday party at her house where all of her little friends were to wear their Halloween costume. Heather made Lexie an adorable mermaid costume (she's so stinkin' clever) so she was adorable...plus we had many Ninjas, lots of Mickey Mouse, Cinderella.... and more....can't remember all of them. Lexie didn't want a cake...she chose donuts this year. So Heather bought beautifully decorated fall donuts and put them on a tiered display with Halloween marshmallow faces tucked in the middle of the donut hole. It was so pretty and colorful! The kids LOVED it...they got to pick out which yummy looking donut they wanted to eat! Sunday we were bums!!! Felt so good! We love to go to "Let's Nosh!" for breakfast. It's the most wonderful "mom and pop" restaurant.... located over by my old store where the Italian restaurant used to be. They have TRUE New York deli style food.... oh my... it is a hidden gem!! You all need to try it! They have the best bagels (sesame double toasted with cream cheese!). Jack LOVES them. You should see the size of their omelets - HUGE!!! Jack always gets the vegetable omelet smothered with mushrooms and cheese. Then they make these fried potatoes... they are coated with something... nice and crispy and yummy. They are also open for dinner 3 nights a week - I think Friday, Saturday and Sunday (have to double check to be sure) I'm all for supporting the small businesses!!! Then...for a FATTENING treat - I took Jack to Shakes! It's located in Orange Park in the out parcel where Woody's Barbecue and Beals Outlet is. Now folks... I'm here to tell you...this is the best ice cream I've ever had (frozen custard). You MUST, MUST, MUST try it! They gave me a sample of the pumpkin frozen custard.... I swear on a stack of Bibles it tasted just like eating a piece of pumpkin pie! My favorite is the chocolate custard shake. The ice cream is so smooth! You should see the size of straw they give you... it's HUGE!! Okay... those are my two small business endorsements for the week!!! Please try them if you live in the Jacksonville/Orange Park area! 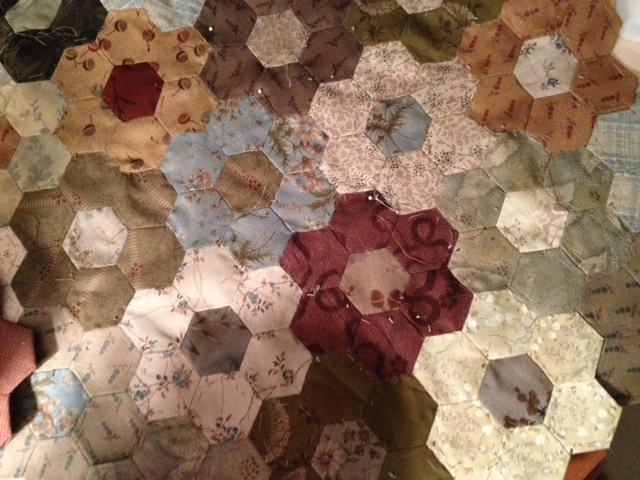 I've been working on my Grandmother's Flower Garden blocks.... made from Japanese Diawabo Fabric. I just love this fabric... such beautiful muted colors.... take a peak!! Here are what many of my blocks look like... see all of those stitches??? Well... I've found a faster and MUCH EASIER way! A gal from Australia (saw her at quilt market) showed me how to use fabric glue (water soluble). So... I got myself all set up in the living room (while watching TV with Jack) and went to town. In less than 4 hours I prepared 55 more blocks!!! 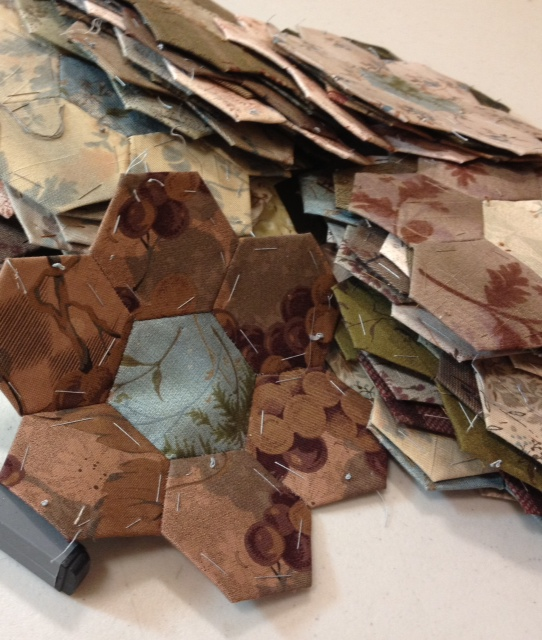 7 hexagons in each block--- 385 of them!!! I was smokin' !!!! I've thought and thought about how to set them together... the traditional way... shaped like a diamond.... should I put a solid color around each one.... oh heck!!! I finally decided to stitch them all together like this!! I love the random look.... I'm not how sure how big this will grow up to be... but I'll just keep working until I've used up all my Daiwabo fabric!! I'm using invisible thread on the top and regular thread on the bottom in a teeny, tiny zig-zag. You can hardly see the stitches. (Thanks Carol for reminding how Blackbird does their applique!) Wow... this is so much faster and EASIER than by hand! 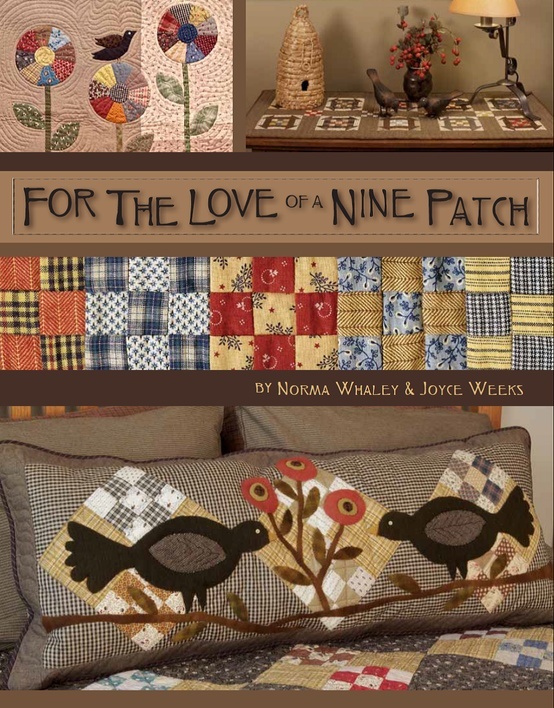 I saw this great book on Pinterest with a subtitle that it will be showing for the first time at October Quilt Market. I can't wait to take a peak inside. I love... love the 9-Patch block! This is so darn cute!!! I'll report back when we return later this month. Ha!!! When I saw this... I thought about Jack! 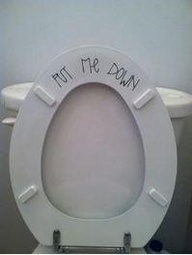 He says that's the one thing that he does when I'm gone traveling... he keeps the toilet seats up!!!! Although...the other day he DID FORGET and fortunately I did notice before sitting down! hahahahahaha! You know... I don't care how many times I see this color combination - I LOVE IT!! Pink and Brown are so warm and pretty together. 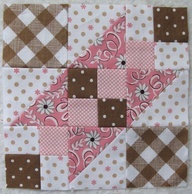 I can't wait to see one of Paula Barnes (Red Crinoline Quilts) pink and brown line of fabric....!! She's working on LOTS OF NEW LINES... wait until you see them. Make sure you tell your favorite Quilt Shop to order her fabrics from Marcus Fabrics. Paula also has a blue and brown/black line coming out... OMG... I saw some strike offs (first prints) and the colors were so darn wonderful! 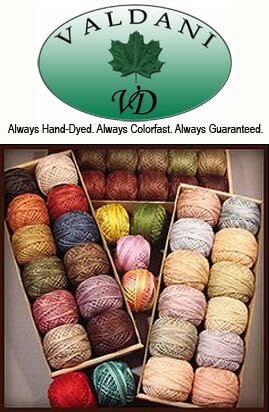 I can't wait to make a quilt from them!! And lastly...take a peak at this sweet baby. I so ... so ... so.... miss my Kitty!!! 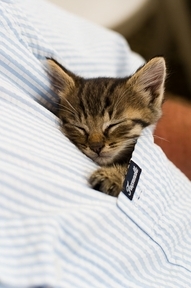 ((sniffle)) How sweet tucked in this man's shirt pocket!! And... look at this brave soul. Can you believe this cat? 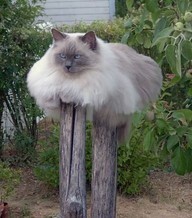 How in the heck can he be comfortable perched on these two poles? What a nut... this is a BIG cat too!!! Meow!! I heard on the news the other day...this is the weekend that has the BEST sales on WOMEN'S clothing... more than any other holiday in the year!! Go figure!! So... I'm going to test out that statement... going for a pedicure, manicure and a little Gloria shopping! Chat with you tomorrow!! Wish me luck - I find great deals! Thank you for keeping your comments fun and lighthearted.